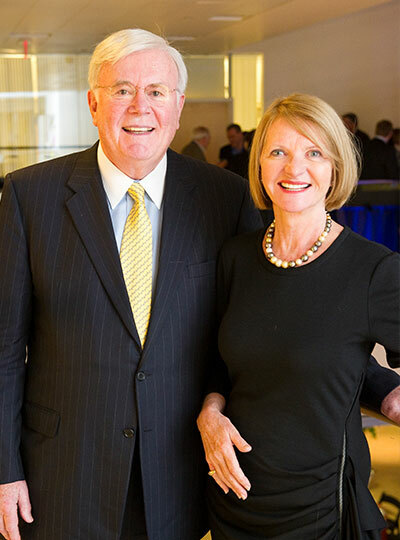 The creation of the McGovern Institute was made possible by the vision and generosity of Patrick J. McGovern ’59 and Lore Harp McGovern, whose commitment remains one of the largest philanthropic gifts in the history of higher education. The McGoverns envisioned an institute whose ultimate goal would be to understand the human brain in health and disease. Before his death on March 19, 2014, Patrick J. McGovern was the founder and chairman of International Data Group (IDG), the world’s leading technology publishing, research, and event management company. He began his publishing career while he was a student at MIT, and since graduating in 1959, he oversaw IDG’s launch of more than 300 magazines and newspapers, including Computerworld, Macworld, and PC World. The founding of the McGovern Institute was for us the culmination of a shared lifelong fascination with the human brain. When we began our careers the prospect of understanding the brain seemed remote, and our professional lives have been focused elsewhere. But over the past several decades, neuroscience has progressed with extraordinary speed, and a few years ago we decided that the time had finally come to undertake a major initiative in this field. The opportunities are enormous. Brain research will change our understanding of how we communicate with each other, how we learn during childhood and throughout life, how we make decisions, how we create new ideas and works of art, and how we can do all of these things better. At the same time, by learning more about the biological origins of prejudice, anger, and violence, we can hope to better control our most destructive impulses. No other field has greater potential to transform society for the better. The benefits that could flow from a better understanding of the human brain are almost beyond imagination. But there is also a cost to be paid if we fail to act. The suffering caused by diseases such as depression or Alzheimer’s disease is all too familiar to those whose lives are directly affected. But brain disorders threaten us all, not just personally but also through their economic impact on society. The costs of treatment, care-giving and lost productivity, already vast, are growing inexorably as human populations age worldwide. This “demographic timebomb” represents a growing crisis that threatens to overwhelm society’s ability to care for those in greatest need. We have an obligation to insure this does not happen, and we believe that the time to act is now. Given the urgent need for more research, we resolved to create a new institute whose ultimate goal would be to understand the human brain in health and disease. To make this vision a reality, we needed to partner with a leading research university, and after careful deliberation we settled on MIT, Patrick’s alma mater, with which we have both had a long association. Fortunately, MIT not only shared our vision but expanded upon it, constructing a spectacular new building that has been home to the McGovern Institute since 2005. The McGovern Institute is still young but is already making exciting progress, and we are deeply gratified every time we hear of new discoveries emerging from its laboratories. The researchers are truly impressive in their talent and dedication. We can feel the excitement every time we visit, and we know the Institute’s future is bright. When future historians look back, what will our era be remembered for? Many things, no doubt, but high on the list will be the extraordinary scientific advances that are unlocking the secrets of life, and most particularly our own mental lives. This dream of understanding the human brain is now within our grasp, and we are convinced that its realization will be the greatest accomplishment of the 21st century. We are proud to play a part in making this happen.